Members of the Howard University ASCE Student Chapter volunteered to work with children at the USA Science and Engineering Festival. One weekend, 2 million square feet, 3,000 exhibits, a quarter-million students. 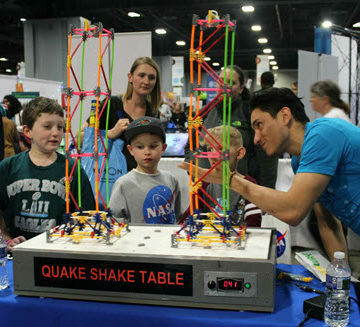 It’s one of the largest STEM events in the world, so you know ASCE had to take part in the USA Science and Engineering Festival, April 6-8, in downtown Washington, DC. ASCE members from nearby Sections and Branches, as well as a large contingent from the Howard University ASCE Student Chapter, volunteered at the festival, educating and inspiring children about civil engineering at the Society’s booth. 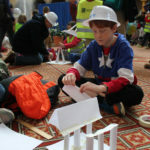 Yasek helped students build and test structures in the Windy City Tower activity, made popular by its inclusion in the ASCE IMAX film Dream Big: Engineering Our World. 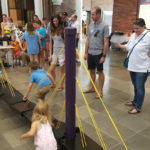 Meanwhile, Matthew McCarty, P.E., S.E., M.ASCE, brought his quake shake table to the festival, and it quickly attracted crowds of kids. For many of the Howard students, it was not so long ago that they were in the role of wide-eyed kids. Now they’re the role models. “I feel like it’s amazing. 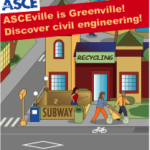 It’s our opportunity to give back and get kids interesting in civil engineering,” said Camille Wallace, S.M.ASCE, a sophomore civil engineering student at Howard.